This important study of semantic change examines how new meanings arise through language use, especially the various ways in which speakers and writers experiment with uses of words and constructions in the flow of strategic interaction with addressees. 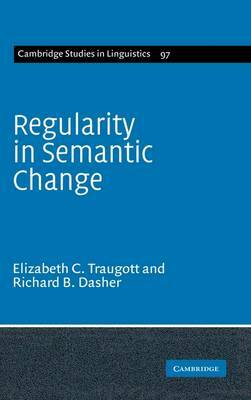 There has been growing interest in exploring systemicities in semantic change from a number of perspectives including theories of metaphor, pragmatic inferencing, and grammaticalization. Like earlier studies, these have for the most part been based on data taken out of context. This book is a detailed examination of semantic change from the perspective of historical pragmatics and discourse analysis. Drawing on extensive corpus data from over a thousand years of English and Japanese textual history, Traugott and Dasher show that most changes in meaning originate in and are motivated by the associative flow of speech and conceptual metonymy.